Follow these general steps to configure reverse DNS using a custom DNS server. Enable DNS resolution for the VPC. You can do this by selecting the VPC, selecting Actions > Edit DNS resolution and choosing Yes. Enable DNS hostnames for the VPC. You can do this by selecting the VPC, selecting Actions > Edit DNS hostnames and choosing Yes. Optionally, you may want to set up an Internet Gateway for the VPC and add a default route to the routing table for the Internet Gateway. Additionally, you may want to enable the Auto-assign Public IP option. This way Cloudbreak would reach the cluster from outside of the VPC and the cluster would have internet access. local-data: "aww1.cloudbreak.cloud. IN A 10.3.3.4"
local-data: "aww2.cloudbreak.cloud. IN A 10.3.3.5"
local-data: "aww3.cloudbreak.cloud. IN A 10.3.3.6"
local-data: "aww4.cloudbreak.cloud. IN A 10.3.3.7"
local-data: "aww5.cloudbreak.cloud. IN A 10.3.3.8"
local-data: "aww6.cloudbreak.cloud. IN A 10.3.3.9"
local-data: "aww7.cloudbreak.cloud. IN A 10.3.3.10"
local-data: "aww8.cloudbreak.cloud. IN A 10.3.3.11"
local-data: "aww9.cloudbreak.cloud. IN A 10.3.3.12"
local-data: "aww10.cloudbreak.cloud. IN A 10.3.3.13"
local-data: "aww11.cloudbreak.cloud. IN A 10.3.3.14"
For detailed steps, refer to AWS documentation. 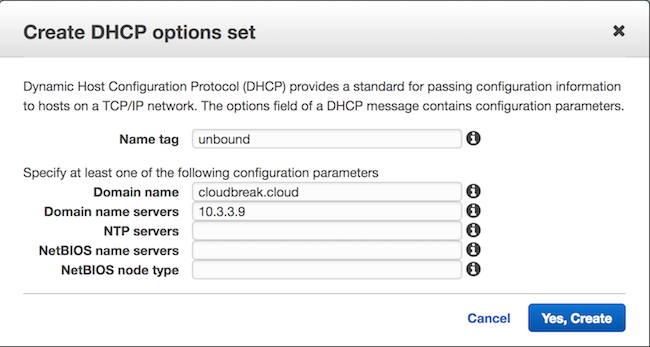 From the Amazon VPC console, select Your VPCs from the left pane. Select the VPC created earlier. Click on Actions > Edit DHCP Options Set. Select the newly created DHCP option set. Step 5: Create the cluster in the VPC configured in the preceding steps and you will have the same hostnames set as the domain names. Since you don’t have control the order over the IP addresses leased to the machines, the names may not be in order.